Twist PET is a Bi-axially oriented transparent polyester film with plain surface on one side and Antistatic on the other side for smooth run-ability on packing machine. This film has excellent dead fold and twist retention characteristics, which are especially designed for confectionary applications like candies, toffee, chocolate, lollipop wrapping etc. This film is available in both transparent and metallized version with a thickness range of 15 to 22 micron. It may be noted that while typical offerings from the market are in the range from 18 to 22 microns, Ester offers this film in the 15 and 12 micron variants also. 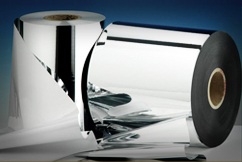 The 15 and 12 micron variants offer a material value proposition to customers versus the use of PVC twist film. In addition, since the Ester film is chlorine free, it provides a higher sustainable quotient to users of this film. The superior twist wrap (dead fold) characteristics of this film ensure that no additional heat is required to provided. This provides dual benefits: the first is a savings in power cost and secondly there is no risk of damaging the food due application of high temperature. Excellent twist retention and superior fold performance. Offers smooth run ability on packing machine. Offers good thermal, mechanical, optical and surface properties. Higher yield resulting in cost advantage.